Our landscape maintenance crews follow a schedule set up on a four week rotation to insure that all aspects of the job are worked on every month. On Monday, or the first visit of the week, the site foreman or leadman walks the total job to develop his punch list of items that need immediate attention, items that need to be done this visit, and items that need to be done at other times during the week. On Monday, or the first visit of the week, all irrigation controllers have their percentages or runtimes changed to the current weekly Eto number (see Irrigation Auditing and Management). On Friday or the last visit of the week, all the water meters are read and the numbers written down for the water usage report. The plants and small trees on the slopes are kept hand pruned, not sheared. Basins are maintained around all the plants to hold in rain and irrigation water. Weeds are pulled and removed, and any litter picked up. Ground covers are pruned to keep them out of the shrubs and trees and off the drain swells and fence lines. The sprinkler system is checked and any necessary repairs or adjustments made. Hedges are kept hedged and individual plants and small trees are hand pruned. All weeds and litter is removed and the bed raked out. Ground covers are pruned to keep growth away from the buildings, plants, sidewalks, and streets. The sprinkler system is checked and any necessary repairs or adjustments made. Lawns are mowed weekly during the growing season, and crossed mowed every four to six weeks. After mowing, the lawns are edged and monuments, fence lines, and other obstacles are weedwhipped. The whole area is then vacuumed and cleaned up. Sprinkler heads are cleaned around, checked, and any necessary repairs or adjustments made. Spraying – Spraying with herbicides and pesticides is done as required to control and/or eradicate specific pests. Repairs – All parts used in the repairs are reported on the daily time sheet along with the specific location they were used. Tree staking and guying – as required. Spot aeration and/or fertilization, lawn seeding or sodding, and planting – as required. Baiting – Snail, gopher and squirrel baits are applied throughout the year. Aeration – All of our lawns are aerated a minimum of twice a year, once in the spring and once in the fall. Fertilization – Lawns are fertilized seven to eight times a year, planters three to five times a year, and slopes two to four times a year. Corrective Pruning – All trees under fifteen feet are thinned and opened up in November and December before the winter winds and rains. Weed Control – Chemicals are applied in the spring to control crabgrass and other lawn and garden weeds. 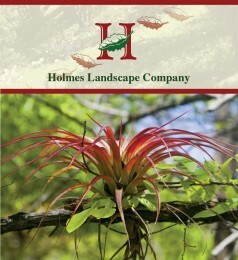 Our rigorous attention to detail and an experienced crew are essential elements that make Holmes Landscape Company successful in providing its customers with the highest quality landscape maintenance program possible.